Fare-thee-well, little Green Tree Frog | who am i? I love animals. So does my 10 year old son, although he’s much more reticent than I am about handling some of the creatures we both love. I work in a semi-rural location. That means, among other things, that I’ve seen all of the following at one time or another on our property: red foxes, skunks, bald eagles, and various species of snakes, turtles, and frogs, to name just a few. Occasionally through the years I’ve caught some of those creatures (mainly the snakes, turtles, and frogs), taken them home for my kids to see and enjoy, and then released them. This summer I brought home a little green tree frog. My 10 year old son wanted to keep him. I thought about it, talked to him about the responsibility of caring for a small wild animal, and decided that we would do it. Just in case you’ve ever wondered, little green tree frogs make big noise, way out of proportion to their size–and they’re nocturnal. You know what that means. Through the night and on in to the early morning hours, our little green tree frog would croak loudly, not caring at all that his captors were trying to sleep. The croak actually sounds more like a quack or a bark. It’s not only fascinating to hear, it’s fascinating to watch. For a while my son was good about remembering to change the frog’s water and feed him; actually, feeding him was a bit of a challenge, because my son is also more reticent than I am about handling the creatures we both love’s food–in this case, live crickets. He learned to do it, although he never learned to like doing it. Eventually, though, he had to be reminded more and more often to take care of his frog. I decided that now, before cool weather arrives, would be a good time to release the frog. My son agreed. So this morning, before work, I released him back onto our property. We kept a little red eared slider for about a year when my oldest son (now 30!) was a little boy. It’s amazing how much the turtle grew in just a year. Your little slider might very well be around for their children. They can live for 50 years or more. I think it’s good for children to learn to love and care for animals, and also to develop a sense of wonder at the great variety and complexity of all that God has created. FIFTY YEARS?!! how wonderful. I can hardly wait to tell my grandchildren. Thanks for that info. They each have a hamster, too. And two dogs, a german shepherd/husky mix, and a long-haired chihuahua. Their daddy loved all animal life and began showing them the mystery and magnificence of God’s creation with roley poleys, rabbits, dogs, and feeding ducks and geese. They’ve been awed ever since. 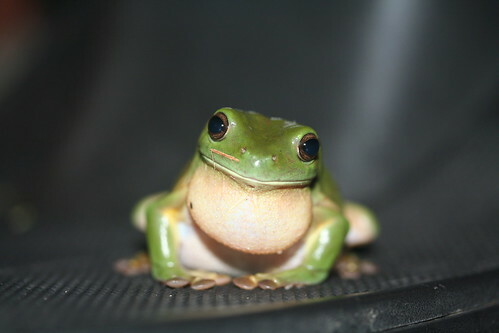 A tree-frog is an amazing undertaking. I can’t even stand the sound of crickets when one gets loose in my house at night and begins its chirping. That’s a good idea, Selah V. I’ll print that out now. I’ve tried to cultivate that same sense of wonder and awe in my kids. My 10 year old informed me recently that when he grows up and has his own house it’s going to be like a zoo! Living in Florida, I see these frogs around my house quite often. For awhile we had one that would attach itself to the sliding glass door next to our dining room table. Very entertaining. There are often 4 or 5 of them attached the siding on the front of our house. Then there are the geckos, skinks and other lizards. Must be hundreds of them around our place . . . When God made “creeping things,” they all immediately headed for Florida. Looks like a few must have over shot and landed in MO.